4Easysoft Mac Video Converter can convert all sorts of videos, including General Videos and HD videos to diverse players and also extract audio from videos, it is also Mac Video to Audio Converter. Still worrying about many contents to convert? 4Easysoft Mac Video to Audio Converter provides you to convert more than one selected files into single one for uninterrupted enjoyment. Working as a common player, Video to Audio Converter Mac application allows you to preview the input and output file at the same time. This video to audio Mac software provides you to get your desired picture by taking the snapshot, and saved it as JPEG, GIF or BMP formats picture. The best 4Easysoft Mac Video to Audio Converter enables you select audio track and subtitle. The original subtitle is not so suitable for watching? Just select one to improve the watching effect. 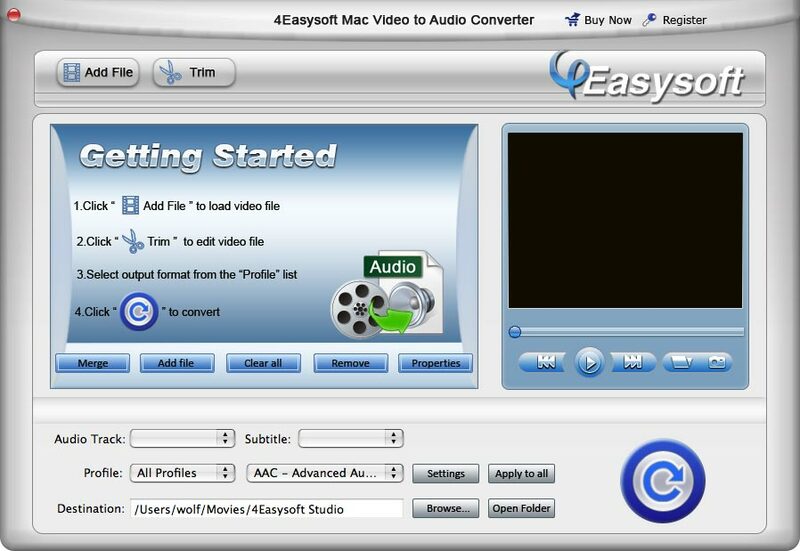 4Easysoft Mac Video to Audio Converter is professional program developed specifically for Mac users, and it supports Mac OS X 10.4 Tiger, Mac OS X 10.5 Leopard and Snow Leopard on Mac. Intuitive interface helps you extract audio from video for your MP3 player with zero learning curve in only a few easy steps. Input one or more files and set several different output file formats for conversion within one single click. Selectable subtitle and audio track are provided for you.